Multifunctional refreshing beauty sheets to slip in your handbag, jeans, anywhere. Gently cleanses and refreshes any time of day. Aloe leaf extract gently conditions and softens the skin. 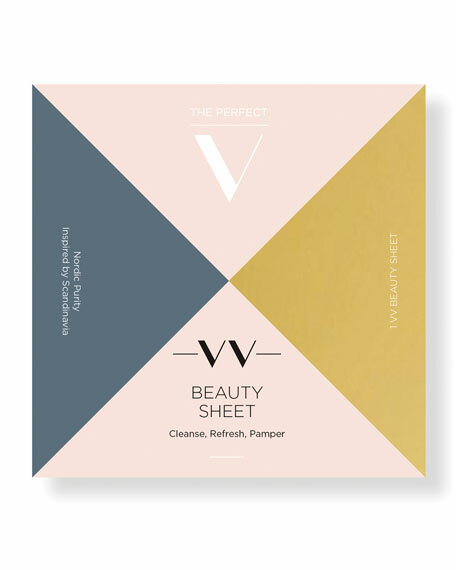 Vitamins A, C and E reduce redness and irritation, treating The Perfect V with antioxidants. Bisabolol, originating from the Candeia Tree, protects and prevents irritation. Soft, generously sized, beauty sheets for the delicate skin of the V.
Lingonberry soothes and is anti-inflammatory. Rosa Canina Oil reduces dryness. Sea Buckthorn soothes the skin. Formulated for the delicate skin of the V area* only. Gently cleanse over the V area to refresh and maintain your beauty VANICURE regimen.